i hate that you are having a discouraging day! Leland potty trained really early and easily (i just got lucky) so i don't really have much advice. my feeling is if they know when they are going to the bathroom then they can go on the potty. Oh I'm so sorry. I'm afraid to start potty training. Savannah turned 2 in March and I'm just not ready to go there. I give you TONS of credit for doing this with two. Hang in there. I have no experience whatsoever, but I did read that if they feel badly after having an accident then they are emotionally ready to potty train and if they could care less and just keep on playing, probably best to wait a little longer and try again. My thoughts are with you over there in poopsville USA (LOL!). Good luck!! Hi! I'm a stranger as in I've just started reading your blog and haven't left a comment before, but wanted to share here. I'm on a board with moms with bigger families, and several highly recommended the book, "Toilet Training in Less than a Day," that it really works. I have been through 6 trainings but still don't feel like I really knew what I was doing--really flying by the seat of my pants...or was it their pants? ANyway, I still have one yet to train, so when I saw the book second hand I snatched it up. It looks wonderful and I'd really recommend getting it (from the library, perhaps?) To give a slight overview, you set aside a day without distractions (as in get dh to take the other children out if you have them). You get a wetting doll, and together with your toddler you "teach" the doll what to do. Then you start with the child. The psychology is clear and the method is VERY specific with the hows and whens of praising and other encouragement, etc. The method gets them pulling down their own pants and emptying their own pot! It helps children who are not necessarily willing too. When they did their testing on scores of children 20 months old and up, only two didn't learn in 4 or so hours, and those two had fathers who undermined the mothers' wishes to train. I would recommend reading the book. I hope you find something that helps! I don't know that I have any extremely helpful advice but I did want to share this. I have an acquaintance who now has 14! children. Once, on her blog, I read that when her kids turn 2 she just puts underwear on them. Diapers off - undies on. She takes them frequently to try and then, just as you, she cleans up any messes they have. I figured if it worked for 14 kids it was good enough for me. As I'm now heading toward training my 3rd child I've decided that this is how I'm going to do it from here on out. It worked well for my second child and when I eventually did it with my first, he caught on quickly. Summer is prime time to train - especially when they can be outside. I also try and keep the potty close by - in the living room? Be encouraged - I bet it won't take more than a couple days of frequent accidents and a week or 2 for them to be fully trained. Hang in there! Oh, poor Mama. I'm sorry it's been a frustrating day for you. With my eldest, I tried to potty-train her just before 2.5. She had accidents all.the.time. Finally, after two months of it, I gave up. She was back in diapers. Just one month later, she took that diaper off and went to the bathroom all by herself and never looked back. Yay! Now if only my second knew that I expected her to potty-train herself. lol. I do not miss potty training! My daughter pretty much trained herself, but my son just took forever. I finally decided that he only had one 'leaving the house' outfit every day. He could put it on in the morning, but if he had so much as one accident, he'd have to get into house clothes following that and couldn't so much as go out into the yard to play. That got his attention pretty quickly! I didn't have to lecture, nag, plead, anything once he understood. It put all of the potty training in his court, because he could either do fun things OR soil himself. UGG>>> In the same boots... I started my 2 yr old daughter last spring... she did good for a week...but I had to tell her to go. Then she got sick and had the runs and we went back to pullups... then about a month ago she said she wanted big girl undies.. she has done much better this time, but still accidents...and it does seem that there are some days she has tons and other days she is dry all day. One granny told me to lower my expectations.... and they seem to know when they are ready.. did my son at almost 3 and it took a week. 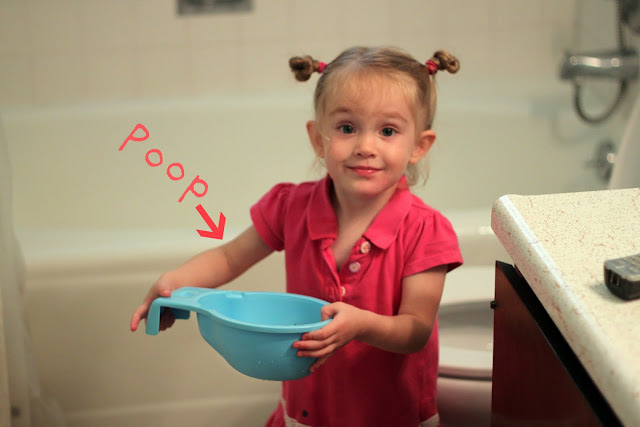 have you read the book "Potty Training in a day"? i kinda used those ideas. We did end up hosing them off outside for poo...but it only takes a time or two of that and they've got it! Good luck...in 6 months or so they'll be pros at it! I don't know how old your girls are, but the magic age for my kids and my granddaughters was 28 months. I had potty bootcamp at my house one weekend and kept Haily in the bathroom first thing in the morning because she was dry and I knew she had to go. I also provided treats. It took a few more weeks for poop, but it worked out pretty well. Good Luck!! The woes of potty training. I have heard with twins it is easier to start with one at a time. If one seems more ready then encourage her and the other will either follow because of all the praise or when she is ready. Then you are only cleaning up half the mess. I remember with Aiden it was a nightmare and so frustrating. We did get some potty toys and that he could only play with while sitting on the potty and then if he went he could play with them for a little while after. That worked for a little while. I finally gave up and I think he was almost 3 and a half when he decided he was ready. I have to say when it was his decision and not mine we never had an accident. Not even at night. I have also heard from other moms that when they forced the potty training there were a lot more accidents than when it was the child's decision. I would wait a little longer and just do one at a time. I have three daughters and all three trained at different ages. I used M&Ms. Just a few when they went, every time they went. So no new advice but my I have read that if your child has a particularly hard time going poop, it can lead them to refusing to go. They associate that uncomfortable feeling with the potty versus a pamper. Not very helpful, but I feel for you. It will get better. Hang in there. My daughter is almost three. and here is my mostly stress free story. I was due with #2 in october. Princess turned 2 in September so we tried a bit during the summer but it was a no go so I waited til #2 was here and tried a christmas break. Some progress and no accidents but then just like your girls she refused to go and it started making me feel not so great towards her so i stopped. Then Spring break i decided to put the potty chair in front of the tv and let her be naked in the am and watch cartoons from the potty. She went and it startled her but she got tons of praise and she liked it. It took 3 days and she was completely out of diapers (naps and bedtime too) and in 6 months has had one accident and she was sick at the time. I don't think my way works for everyone but it worked for her. She needed to be distracted for it to work and i realize now that she was not ready the times i tried before. One of her friends who is the same age potty trained her daughter in september and she still has a diaper at naps and bed and her mom now realizes she just wasn't ready. It'll be a much nicer time for all three of you if everyone is ready.